The main crisis is the catastrophic reduction of water in the Neelam River flowing inside the Muzfarabad city. The Neelam River has almost dried from Nosari to Muzaffarabad after the inauguration of of Neelam Jehlum Hydral Power project, due to diversion of 90 percent of the river water to the tunnel from Nosari. In 2008 when the project was started, it was stated that as per international standards only twenty percent water would be diverted to the tunnel but now the situation is totally opposite. For that reason the river has dried and the life of human, animals and underwater species—as well as the biodiversity of the river—is being affected badly and is actually endangered. 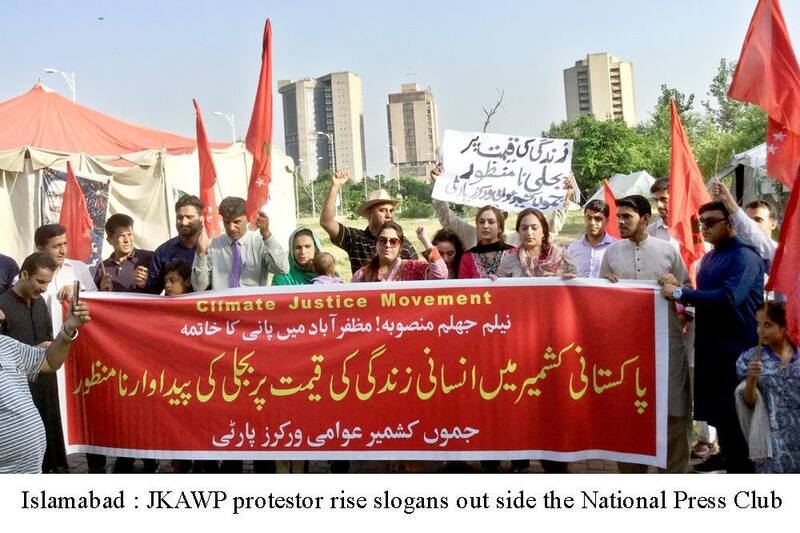 Jammu Kashmir Awami Workers Party Chairperson Nisar Shah Advocate said that it is very unfortunate that the State of Pakistan is only interested to generate the electricity from the water of Kashmir, meanwhile it has totally failed to protect the rights of local people and Government. In all International treaties and Conventions Pakistan has made commitments that it will protect the human rights and the resources of local people but the mega projects have caused miseries to the people in addition to the environmental degradation. He said that JKAWP and all other political parties of Azad Kashmir are demanding that the people and Government of Azad Kashmir should have the power to decide any project to develop their natural resources. While the reality is that all mega projects are being made without any proper consultation, environmental, social and strategic assessments. In addition to the violation of drawing 90 percent instead of 20 percent water of Neelum River, the promise of creating small lakes in the lower basin of river from Noseri to Muzfarabad has not been fulfilled. It was said that all the adverse effects of the project would be mitigated or compensated but the government has failed to fulfill such commitments. He said that presently Azad Kashmir is producing around 2500 Megawatt of electricity, its total consumption is 400 Megawatt but the four million people of Azad Kashmir are facing the shortage and load shedding for long hours. Therefore people of Azad Kashmir are demanding that the area should be free of load shedding. He said a full autonomous and prosperous Azad Kashmir is demand of the people which should be respected by Pakistan as promised to international community.